Hume attended the University of Edinburgh at the unusually early age of twelve (possibly as young as ten) at a time when fourteen was normal. At first he considered a career in law, but came to have, in his words, an insurmountable aversion to everything but the pursuits of Philosophy and general learning; and while my familyfancied that I was poring over Voet and Vinnius, Cicero and Virgil were the authors which I was secretly devouring. He had little respect for the professors of his time, telling a friend in 1735 -- there is nothing to be learnt from a professor, which is not to be met with in books. Hume made a philosophical discovery that opened up to himanew scene of thought which inspired himto throw up every other pleasure or business to apply entirely to it. He did not recount what this scene was, and commentators have offered a variety of speculations. Due to this inspiration, Hume set out to spend a minimum of ten years reading and writing. He came to the verge of a nervous breakdown, after which he decided to have a more active life to better continue his learning. Hume wrote a great deal on religion. The question regarding Hume's personal views on religion is a difficult one. The Church of Scotland seriously considered bringing charges of infidelity against him. In works such as On Superstition and Enthusiasm, Hume specifically seems to support the standard religious views of his time and place. This still meant that he could be very critical of the Catholic Church, referring to it with the standard Protestant epithets and descriptions of it as superstition and idolatry as well as dismissing what his compatriots saw as uncivilized beliefs. He also considered extreme Protestant sects, the members of which he called enthusiasts, to be corrupters of religion. Yet he also put forward arguments suggesting that polytheism had much to commend it in preference to monotheism. 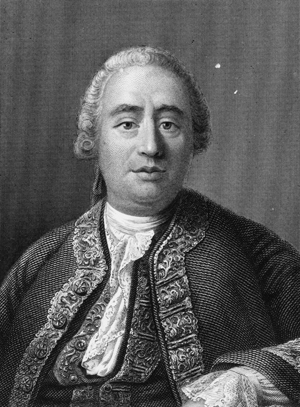 It is likely that Hume was skeptical both about religious belief (at least as demanded by the religious organizations of his time) and of the complete atheism promoted by such contemporaries as Baron d'Holbach. Paul Russell suggests that perhaps Hume's position is best characterized by the term irreligion. David O'Connor writes that Hume did not believe in the God of standard theism ... but he did not rule out all concepts of deity. Ambiguity suited his purposes, and this creates difficulty in definitively pinning down his final position on religion. Marc Hanvelt identifies Hume as an Aristotelian in his view that rhetoric is a form of ethical studies, which ultimately makes it political. From 1763 to 1765, Hume was secretary to Lord Hertford in Paris. He met and later fell out with Jean-Jacques Rousseau. He wrote of his Paris life, I really wish often for the plain roughness of The Poker Club of Edinburgh ... to correct and qualify so much lusciousness. For a year, from 1767, Hume held the appointment of Under Secretary of State for the Northern Department. In 1768 he settled in Edinburgh where he lived from 1771 until his death in 1776 at the southwest corner of Saint Andrew's Square in Edinburgh's New Town, at what is now 21 Saint David Street. A popular story, consistent with some historical evidence, suggests the street was named after Hume. 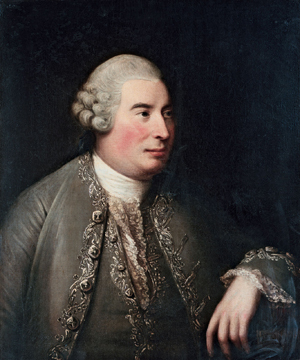 James Boswell saw Hume a few weeks before his death (which was from some form of abdominal cancer). Hume told him he sincerely believed it a "most unreasonable fancy" that there might be life after death. This meeting was dramatized in semi-fictional form for the BBC by Michael Ignatieff as Dialogue in the Dark. Hume asked that he be interred in a simple roman tomb. In his will he requests that it be inscribed only with his name and the year of his birth and death, leaving it to Posterity to add the Rest. Around the same time that Hume was composing his “Natural History of Religion” he was also working on his Dialogues Concerning Natural Religion, which appeared in print two decades later, after his death. As the title of the work implies, it is a critique of natural religion, in contrast to revealed religion. There are three principal characters in Dialogues. A character named Cleanthes, who espouses religious empiricism, defends the design argument for God’s existence, but rejects the causal argument. Next, a character named Demea, who is a religious rationalist, defends the causal argument for God’s existence, but rejects the design argument. Finally, a character named Philo, who is a religious skeptic, argues against both the design and causal arguments. The main assaults on theistic proofs are conveyed by both Cleanthes and Philo, and, to that extent, both of their critiques likely represent Hume’s views.The specific version of the causal argument that Hume examines is one by Samuel Clarke (and Leibniz before him). Simplistic versions of the causal argument maintain that when we trace back the causes of things in the universe, the chain of causes cannot go back in time to infinity past; there must be a first cause to the causal sequence, which is God. Clarke’s version differs in that it is theoretically possible for causal sequences of events to trace back through time to infinity past. Thus, we cannot argue that God’s existence is required to initiate a sequence of temporal causes. Nevertheless, Clarke argued, an important fact still needs to be explained: the fact that this infinite temporal sequence of causal events exists at all. Why does something exist rather than nothing? God, then, is the necessary cause of the whole series. In response, the character Cleanthes argues that the flaw in the cosmological argument consists in assuming that there is some larger fact about the universe that needs explaining beyond the particular items in the series itself. Once we have a sufficient explanation for each particular fact in the infinite sequence of events, it makes no sense to inquire about the origin of the collection of these facts. That is, once we adequately account for each individual fact, this constitutes a sufficient explanation of the whole collection. He writes -- Did I show you the particular causes of each individual in a collection of twenty particles of matter, I should think it very unreasonable, should you afterwards ask me, what the cause of the whole twenty was. Hume’s moral theory appears in Book 3 of the Treatise and in An Enquiry Concerning the Principles of Morals (1751). He opens his discussion in the Treatise by telling us what moral approval is not: it is not a rational judgment about either conceptual relations or empirical facts. To make his case he criticizes Samuel Clarke’s rationalistic account of morality, which is that we rationally judge the fitness or unfitness of our actions in reference to eternal laws of righteousness, that are self-evidently known to all humans, just as is our knowledge of mathematical relations. Hume presents several arguments against Clarke’s view, one of which is an analogy from arboreal parricide: a young tree that overgrows and kills its parent exhibits the same alleged relations as a human child killing his parent. Is not the one tree the cause of the other’s existence; and the latter the cause of the destruction of the former, in the same manner as when a child murders his parent? If morality is a question of relations, then the young tree is immoral, which is absurd. Hume also argues that moral assessments are not judgments about empirical facts. Take any immoral action, such as willful murder -- examine it in all lights, and see if you can find that matter of fact, or real existence, which you call vice. You will not find any such fact, but only your own feelings of disapproval. In this context, Hume makes his point that we cannot derive statements of obligation from statements of fact. 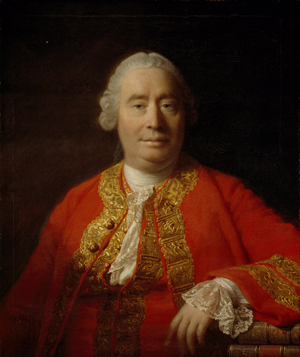 When surveying various moral theories, Hume writes -- I am surprised to find,that instead of the usual copulations of propositions, is, and is not, I meet with no proposition that is not connected with an ought or an ought not.This move from is to ought is illegitimate, he argues, and is why people erroneously believe that morality is grounded in rational judgments. It is difficult to categorize Hume's political affiliations. His thought contains elements that are, in modern terms, both conservative and liberal, as well as ones that are both contractarian and utilitarian, though these terms are all anachronistic. Thomas Jefferson banned Hume's History from the University of Virginia, fearing that it spread universal toryism over the land. Yet, Samuel Johnson thought Hume to be a Tory by chance... for he has no principle. If he is anything, he is a Hobbist. His central concern is to show the importance of the rule of law, and stresses throughout his political Essays the importance of moderation in politics. This outlook needs to be seen within the historical context of eighteenth century Scotland, where the legacy of religious civil war, combined with the recent memory of the 1715 and 1745 Jacobite risings, fostered in a historian such as Hume a distaste for enthusiasm and factionalism that appeared to threaten the fragile and nascent political and social stability of a country that was deeply politically and religiously divided.